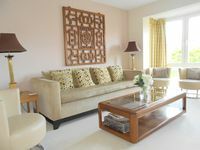 Property 25: A beautiful property, centrally located in Guildford. Your home away from home. A modern Family home, renovated to a very high spec, inc separate log Cabin. Property 46: A modern Family home, renovated to a very high spec, inc separate log Cabin. We had a lovely stay over Christmas with a beautiful Christmas Tree and decorations left for us and the children to enjoy. Perfectly placed for easy trips into London, yet very peaceful spot. Comfortable accommodation and thoughtful owners. Our family booked this home for our first time visit to London. We found it to be a pleasant home home base for 3 nights. There was starter foods and a bottle of wine in the refrigerator which certainly helped us to feel welcome as we settled in. The home was clean and the beds were comfortable. We found the pictures to be accurate and had all the necessities one would need while on holiday. It was convenient to the over ground train station and co-op grocery store. The owner was easy to work with and responded quickly to my questions about the property. Pictures were accurate and the home was as described. 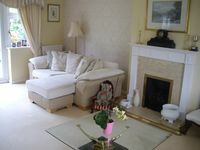 We enjoyed our stay at this home and would it recommend to others wishing to see the London area.